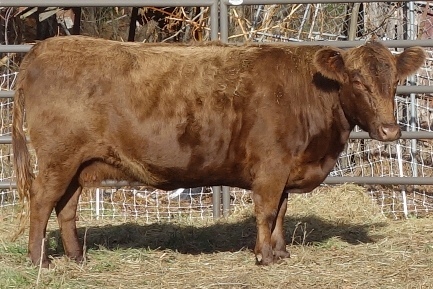 Rousseau is a wonderful combo of beef & milk genetics, and consistently passes his docile, friendly disposition. A few months ago, I updated our “Breeding Program” page, adding a list of our breeding priorities here at Hope Refuge Farm. Some people may think that having such high standards doesn’t matter unless you want show-quality animals, and that your average, “mediocre” Dexter is fine for merely utilitarian purposes. Besides, a mediocre Dexter & a show-quality Dexter produce milk & beef that taste the same, right? And, since some people may want just a pet or lawn ornament & that is a legitimate use for a mediocre Dexter as well, why should we bother trying to breed something “better”? Lucky brings nearly faultless structure with exceptional depth, width & muscling to our breeding program. Well, let me tell you why I think it’s a good idea to breed a better Dexter. For me, it’s not about show-quality vs. utilitarian so much as it about the Dexter breed reputation in the larger world of cattle. I hear Dexters getting a lot of bad rap, and I’m sick & tired of it. Unfortunately, a lot of that bad rap is well warranted, due to the large number of poor quality Dexters out there. Serious beef people see pictures of ugly, poorly muscled young Dexter bulls for sale, and think the entire breed is a joke. Folks who want a good, little family milk cow will get a cheap Dexter, and get frustrated with a cow that has a nasty temperament & kicks them into next week, has bad udder or teat structure making milking difficult, and has pathetic milk production to boot. They sell the cow in disgust & tell everybody they know, “Don’t get a Dexter!”. Janie, and her half-sister Sally, bring high volume milk production & excellent longevity from both their dams’ & their sire’s lines. The Dexter breed also is not touted & promoted as lawn ornaments or pets. They’re touted as being DUAL-PURPOSE…..and that means that most people expect them to be PRODUCTIVE. 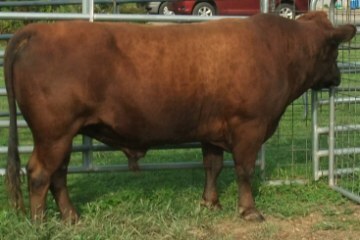 The majority of folks interested in Dexters want an animal that can reliably provide beef and/or milk for their family. When times get tough & money is tight, people will want a productive, useful animal that can truly pull it’s weight on the homestead. Instead, we’ve got a large number of mediocre animals with poor production traits running around that have made the breed into the laughing-stock of the greater cattle world. And though a mediocre, poorly muscled Dexter may taste the same as a “show-quality” one, you will clearly get more beef off one of them…and it won’t be the mediocre one. 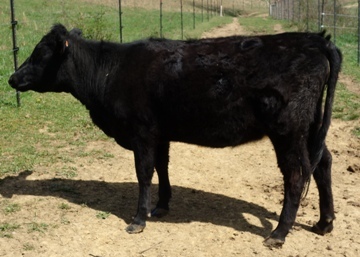 Moonshine is a great example of a quality heifer calf – thick bodied throughout, with good structure & the makings of a nice udder. Here at Hope Refuge, we are not interested in a showing career for our Dexters, though we may dabble with it now & then just to see how our animals compare with others. Rather, we are interested in our Dexters producing quality milk & beef for our family & others. We therefore want to breed quality, PRODUCTIVE animals that will live up to people’s (and our own!) expectations & the reputation the breed is supposed to have – that of dual-purpose production. 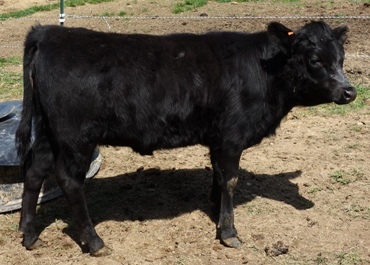 We are bringing in genetics for better muscling & beef traits, as well as bloodlines for higher milk production. We are breeding for structurally sound animals that will hold up well for a long, productive breeding life…not so they can win at a show, but so they can do their “job” as well as possible. We also strive to work with bloodlines that exhibit great longevity, so that we know that “keeping ability” is there to start with. Of course, another part of breeding quality animals is culling the ones that don’t measure up, a practice we firmly believe in. I am passionate about my Dexters, and part of that passion is breeding the absolute best animals I possibly can. I always try to keep the best interest of the breed in mind, rather than my own best interest, or the interest others have in fads. And while Dexters will never compete with beef breeds for beef production, nor with dairy breeds for milk production, they should be an excellent combination of milk & beef for small-scale, niche market production. And that is why I want to breed a better Dexter! Great post Kim – need more breeders who are thinking like you!